This installment of our “Five Questions” series features inquiries about camera choice, Lightroom’s Dehaze feature, file settings for black and white printing, and location info at Great Smoky Mountains, Bryce Canyon and Zion national parks. 1. Great Smoky Mountains Closed at Night? Cades Cove, Great Smoky Mountains National Park. Nikon D850 with a Sigma 35mm f/1.4 Art lens. 30 seconds, f/5.6, ISO 64. © 2018 Matt Hill. Great Smoky Mountains is usually open 24/7/365.25. But there’s a caveat. You may have been trying to enter Cades Cove—one of the most popular destinations at GSM. The gates at the beginning of that 11-mile loop road are closed at dusk and opened at dawn. But that is only to keep motorvehicles out; visitors can park nearby and walk or bike through Cades Cove anytime. 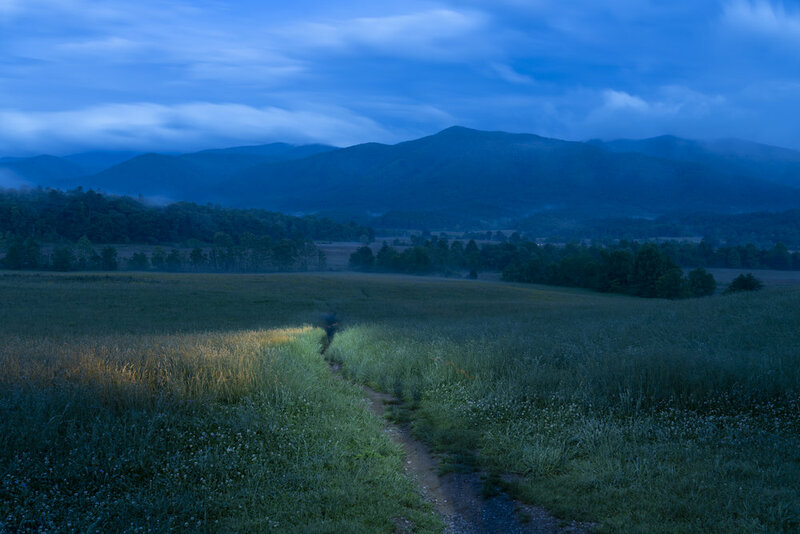 In fact, we will be going into Cades Cove twice during our workshop. The first time will be on foot. We’ll saunter a comfortable walking distance, which still offers plenty of shooting opportunities, such as the horse meadow, Sparks Lane, the Carter Shields Cabin and the Oliver Cabin. Our second jaunt into Cades Cove will be as an add-on opportunity that will avail the entire loop road to us. Note: We still have a few spots open for our Great Smoky Mountains workshop this spring. Interested? Click here! Q: How come my Lightroom 6 does not have the Dehaze slider? Are there any add-ons to LR that have the same quality Dehaze function that I can use? — Bailing L.
A: The reason Dehaze slider isn't showing up for you in Lightroom 6 is because the feature wasn't added until the next version of the software, which was when the subscription-only model of Lightroom Creative Cloud was launched. In fact, Dehaze was the major feature added to the program right after launch to entice more people to sign up. And I gotta say, while I’m not a fan of the subscription-only model, there’s an argument to be made that the Dehaze feature alone is worth the upgrade. It's an amazing tool with a lot of ancillary uses. One such application is to make starry skies and the Milky Way “pop,” as can be seen in this blog post by Tim. The Amphitheater at dusk, Bryce Canyon National Park. Fuji X-T2 with a 10-24mm f/4 lens at 10mm. 3 seconds, f/7.1, ISO 200. © 2018 Tim Cooper. Q: I’ve already booked hotels for your Valley of Fire and Grand Canyon workshops. So excited! While in the region, I'm thinking about hitting Bryce Canyon and Zion. Do you have any advice about good areas to shoot without 4-mile hikes? — Julianne K.
A: There’s a ton to see and shoot at both parks without having to hit long trails. In Zion, be sure to drive into the main canyon and also up through the tunnel toward Checkerboard Mesa. Stop at any pullout along these roads and enjoy the incredible scenery! You can’t miss. At Bryce, any viewpoints along the 15-mile road offer awesome overlooks of the canyon. Think sunrise for these viewpoints (especially Sunrise Point). Note: Due to a cancellation, a spot just opened up for our Bryce Canyon workshop this summer. Interested? Click here! Q: I have two specific photography interests—night and underwater. I’ve been using a Canon 5D Mark III for night photography and time-lapse. I also use a Nikon D7000 for underwater. I’m planning to replace the D7000 with a higher-resolution camera, hopefully one that I can use for both underwater and night photography. My options are to buy an underwater housing and lenses for the 5D Mark II, or stay with a DX-format (Nikon D500) with a new housing, or go with something else like a Nikon D850. I would like to get to the point where I am using Nikon or Canon, not both. Which camera would you recommend to meet my needs? — Richard R.
A: Camera choice is a personal decision, and there are lots of factors to consider. I have yet to find the perfect camera, or one that offers everything I’m looking for in one package. Given that you have Canon glass for full-frame cameras, I’d concentrate on comparing the 5D Mark IV to the D850. I think the Mark IV is the best camera Canon has ever made, and the first one that surpasses the 6D for high ISO night photography. The D850 is an awesome camera, but if you use live view focusing at night, I’d probably go with the Mark IV, especially if you have a number of L lenses. Why not rent them both and see which feels better? Q: I sent a black and white image from the Sloss Furnaces workshop to Bay Photo to have printed for the NPAN exhibit there. I converted to black and white in Lightroom, exported to Photoshop for star stacking, flattened, and then brought the file back in to Lightroom. But Bay Photo is telling me that the image is not in the correct format—that instead of grayscale it needs to be converted back to RGB to make a black and white print. So I then tried keeping the photo in color and just dropping Saturation and Hue to 0 to create a black and white image “in color,” but that washed out the shadows. I’m lost here. Any suggestions or insight? — Martha H.
A: Very cool that you’ll be participating in the exhibit! This is the third park that our workshop attendees will have a show in. It will be running April 1 to June 1 at the Sloss Furnaces visitor center. As for your question: In short, any file that is sent to a printer should be an RGB image, not grayscale. 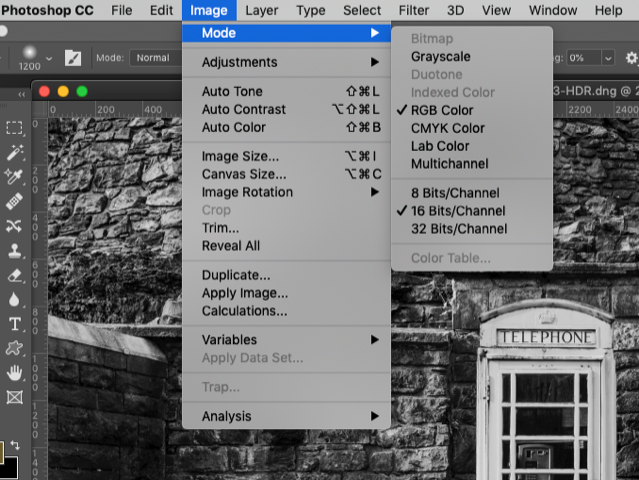 Even if you convert an image to black and while in Lightroom, it still sends an RGB image over to Photoshop. Below is a screenshot of an image that I converted to black and white in Lightroom and then sent to Photoshop. If I go to Image > Mode, you can see that the file is a 16-bit RGB image. This is normal and the way it should be. The difference? An RGB image can be black and white, or it can be color. A grayscale image can only be black and white. My guess is that you did something in Photoshop to convert it, intentionally or not. Reopen that image in Photoshop (from Lightroom, choose Photo > Edit In > Edit in Adobe Photoshop CC 2019). Go to Image > Mode, and click on RGB Color.